My mom asked for a healthy dessert for her birthday this year, and being short on time and looking for something she could also take home for snacks, this is what ended up happening. 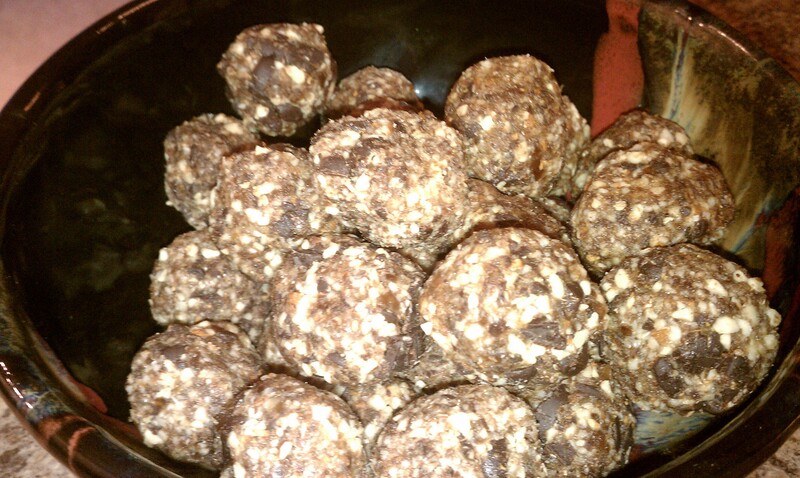 These no-bake cookie balls are delicious and totally customizable to your own taste! Grind almonds in food processor until it is a coarse flour-like texture, not too fine. Place in a bowl and set aside. Place the dates in the food processor and blend until chopped well. Add cinnamon, flaxseed, cinnamon and ground almonds and blend until well combined. Mix in chopped chocolate chips by hand. Using a tablespoon measuring spoon, scoop the “dough” and form into a firm ball in your hand. Store in the refrigerator. Nutrition bonus: Almonds contain heart healthy monounsaturated fat and vitamin E, an antioxidant (also look here for more information about how to get more antioxidants in your diet). Dates contain fiber, antioxidants, potassium [helpful for lowering blood pressure] and iron for energy boosting. Dark chocolate and cinnamon also contain antioxidants and cinnamon helps to stablize blood sugars as well [important for everyone, not only diabetics]. Flaxseed is a source of ALA, an omega-3 fatty acid, and also adds fiber to your diet and contains lignans – more antioxidants! These look great girl!!! I am a sucker for anything with almondsand dates! This will be the first Christmas cookie recipes of the season for us! !